Place this Sat Nav on your car's dashboard and you'll enjoy a simple to use device with a clear 5” touchscreen display. 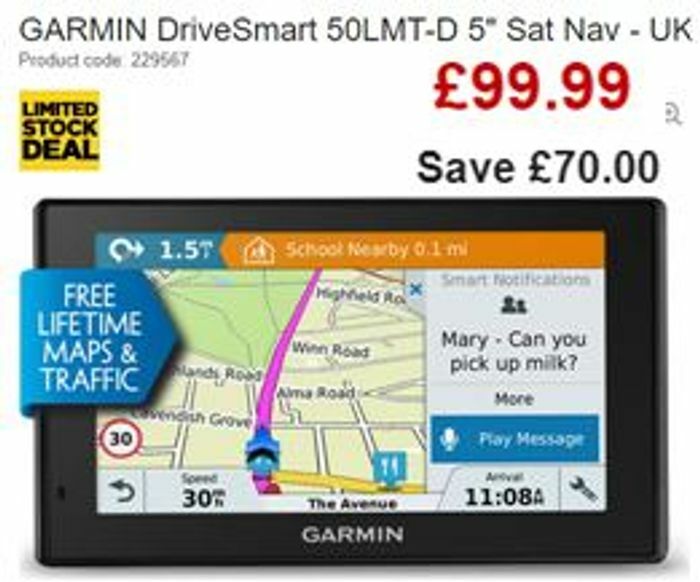 The Garmin DriveSmart 50LMT-D 5" Sat Nav comes with lifetime map updates for the UK and Ireland. Connect the Garmin DriveSmart to your smartphone using the Smartphone Link mobile app for real-time information such as live traffic, parking information and weather updates. Garmin Real Directions get you where you need to be with simple and easy to understand instructions. Landmarks and clear sights are mentioned to help you along the way such as “Turn right after the yellow building” or “Turn left after the supermarket”. If you're looking for a nice restaurant or a hotel to stay at overnight, you can also view ratings for nearby points of interest along your route or near your destination. Useful features help you get to your destination and stay safe along the way. You'll get alerts for sharp curves, speed changes, railway crossings, animal crossings, school zones, speed cameras and more. A fatigue warning suggests break times and potential rest areas for when you're on a longer drive. Sync your Bluetooth-enabled smartphone to the DriveSmart to make hands-free phone calls and receive text messages straight to the sat nav's display. Stay connected without taking your hands off the wheel. new businesses, road changes and junction alterations.